The proud Regulars of Company H made a gallant stand in the bload-soaked Wheatfield on day two of the Battle of Gettysburg. Read all about it inside. When the American Civil War erupted in April 1861, the 10 companies of the 4th U.S. Infantry were spread along the West Coast from Puget Sound to the Gulf of California in various small, far-flung garrisons. After distinguished service in the Mexican-American War and garrison duty along the Great Lakes from Mackinac to Platsburgh, the regiment had speant the last nine years garrisoning posts, guarding the coast, escoting new settlers, and fighting Indians. Company H, commanded for a time by Captain Ulysses S. Grant in the early 1850s, was based at Fort Vancouver in the Washington Territory. With the outbreak of the Civil War, authorities quickly realized that the main body of the Regular Army would be needed back East to form a reserve force and train the multitude of state volunteer forces that were hurriedly mustering in to suppress the rebellion. The 4th returned by sea after a disease-ridden march across the Isthmus of Panama. It arrived at New York and then traveled by train to the camps of the Army of the Potomac around Washington D.C. in November 1861. Inside “4th U.S. Regulars at Gettysburg,” a richly detailed feature in the Early Summer edition of Civil War Quarterly, you’ll read all about how the proud Regulars of Company H made a gallant stand in the bload-soaked Wheatfield on day two of the Battle of Gettysburg. Writers Donald McConnell and Gustav Person bring you another side to Gettysburg, and let you really get to know these brave men and officers. What do you think of Company H’s performance at the Battle of Gettysburg? Did McConnell and Person help you see the battle in a new light? 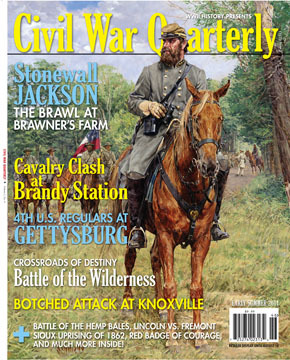 Let us know what you think about this and other features in this Civil War Quarterly issue in our comments section. Tags Abraham Lincoln, Army of the Potomac, Battle of Gettysburg, Confederate, Emancipation Proclamation, Mexican-American war, Sabine Pass, Stonewall Jackson, Ulysses S. Grant.